Not all non-native plants and animals turn out to be invasive in a new environment. How can we predict whether a species poses a threat to local waters? If we could predict that, how can we make the best use of that information? IISG and University of Notre Dame researchers set out to answer the first question by analyzing which traits help a species thrive in a new environment. They brought this data to an Indiana working group looking to proactively prevent the introduction of invasive plant species through water garden and aquarium retailing. The group of researchers, resource managers, retailers, and hobbyists created a risk assessment tool and their work led to 28 aquatic plants being banned in the state. As a result of this work, Notre Dame’s David Lodge, and Reuben Keller, now with Loyola University Chicago, were funded through the Great Lakes Restoration Initiative to create risk assessment tools for all taxa in the Great Lakes, including crayfish, fish, mollusks, plants, and turtles. These tools can help decision makers establish consistent and comprehensive regulations focused on species that pose the biggest threat. Meanwhile, IISG’s aquatic invasive species (AIS) team has been pulling out all the stops to distribute information that can help prevent the spread of AIS in trade—in other words, species that are bought and sold for water gardens, aquariums, and to a lesser extent, classrooms. Leading the effort as part of the Great Lakes Sea Grant Network, and informed by social science research from North Carolina State University, the specialists are targeting all levels of this AIS pathway—from retailers to hobbyists—and sharing information across the region through a variety of media. The suite of tools contains publications for retailers and their customers that include lists of non-invaders as well as known or potential invaders. “Many of these resources are informed directly from the risk assessment findings,” said Pat Charlebois, AIS outreach coordinator. Great Lakes Sea Grant programs and the Sea Grant Law Center are contributing their expertise. For example, Wisconsin Sea Grant created a training video for water garden retailers, and Ohio Sea Grant hosted a webinar for aquarium hobbyists. In addition to writing news articles, other programs helped craft non-technical versions of relevant state regulations to give retailers easy access to the information. All of this work is raising awareness and potentially changing behavior. “Most of the retailers that have received materials about the risk of AIS have reported that they will distribute publications and talk with their customers about invasive species, and a majority will avoid selling them,” said Greg Hitzroth, IISG AIS outreach specialist. 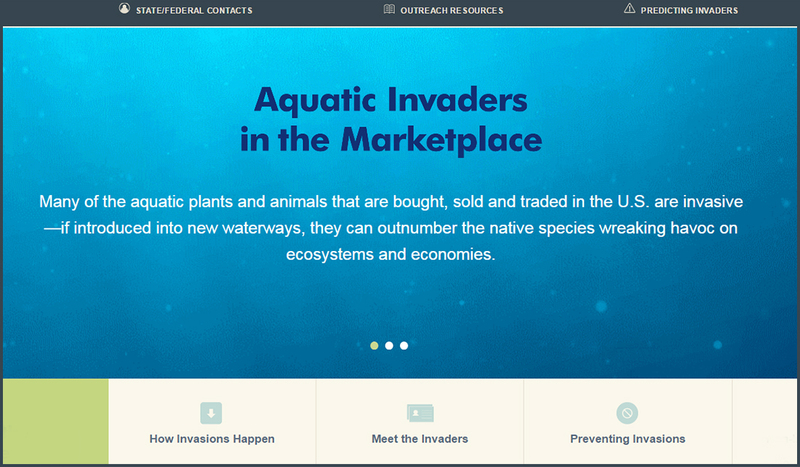 You can find these resources and many more on the new website Aquatic Invaders in the Marketplace (AIM) or TakeAIM.org. AIM are aquatic plants and animals available for sale that can negatively impact ecosystems, economies, or public health. These organisms are commonly found in the live food, aquarium, pet, biological supply, live bait, water garden, and aquaculture industries. This comprehensive resource provides a wealth of information for resource managers, retailers, hobbyists, aquatic farmers, and more on how to prevent the spread of AIS that can happen with plants and animals that come to new environments through the marketplace. The website includes links to regulations, lists of contacts and invasive species, and species prediction tools for the Great Lakes and beyond.